(Nanowerk News) Whether it is in catalytic processes in the chemical industry, environmental catalysis, new types of solar cells or new electronic components, nanoparticles are everywhere in modern production and environmental technologies, where their unique properties ensure efficiency and save resources. The special properties of nanoparticles often arise from a chemical interaction with the support material that they are placed on. Such interactions often change the electronic structure of the nanoparticle because electrical charge is exchanged between the particle and the support. Working groups led by Friedrich-Alexander-Universität Erlangen-Nürnberg (FAU) and the University of Barcelona have now succeeded in counting the number of elementary charges that are lost by a platinum nanoparticle when it is placed onto a typical oxide support. Their work (Nature Materials, "Counting electrons on supported nanoparticles") brings the possibility of developing tailor-made nanoparticles a step closer. One of the main questions that nanoscience researchers have been discussing for some time now is how nanoparticles interact with the support that they are placed on. It is now clear that various physical and chemical factors such as the electronic structure, the nanostructure and – crucially – their interaction with the support control the properties of nanoparticles. Although this interaction – specifically the transfer of electrical charge – has already been observed to a great extent, previous studies have not investigated how much charge is transferred and whether there is a relationship between the transfer and the size of the nanoparticle. In order to measure the electrical charge that is exchanged the international team of researchers from Germany, Spain, Italy and the Czech Republic led by Prof. Dr. Jörg Libuda, Professor of Physical Chemistry, and Prof. Dr. Konstantin Neyman, University of Barcelona, prepared an extremely clean and atomically well-defined oxide surface, onto which they placed platinum nanoparticles. Using a highly sensitive detection method at Elettra Sincrotrone Trieste the researchers were able to quantify the effect for the first time. 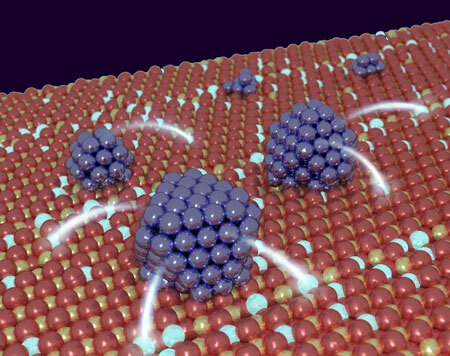 Looking at particles with various numbers of atoms, from several to many hundred, they counted the number of electrons transferred and showed that the effect is most pronounced for small nanoparticles with around 50 atoms. The magnitude of the effect is surprisingly large: approximately every tenth metal atom loses an electron when the particle is in contact with the oxide. The researchers were also able to use theoretical methods to show how the effect can be controlled, allowing the chemical properties to be adapted to better suit their intended application. This would allow valuable raw materials and energy to be used more efficiently in catalytic processes in the chemical industry, for example.